Recently I participated in the #givehealthy chat on Twitter. 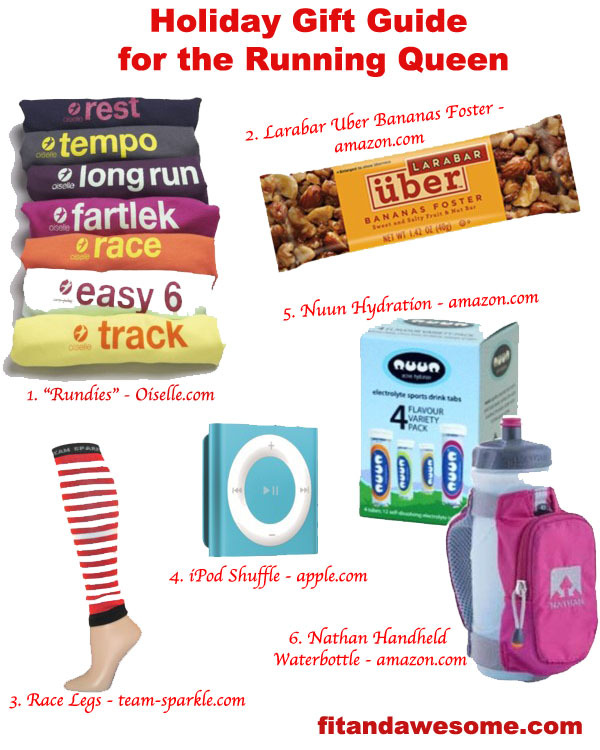 I loved all the Holiday Gift Ideas for Runners and decided to ask around on Twitter and see what my runner tweeps recommend and add it to my personal favorites to create a unique list of my own. Here it is. Enjoy! And if you have any of these items or decide to get them for others, post in the comments and let us know! 1. Rundies – I was introduced to these by @SarahChan on Twitter and I thought they were hilarious. My favorite one is the one that says Fartlek on the back. 2. Larabar Uber Bananas Foster –These are my favorite bars on the market right now. Gluten free and packed with good stuff. I even wrote a review on them awhile back. Great to keep in your car, desk at work, or your gym bag for a quick on-the-go snack. 3. Race Legs – Team Sparkle. I was also introduced to these on Twitter by @According2Kelly. I was looking for an outfit to wear for our Christmas Run in Santa Monica / Venice this past weekend and she sent me these as an idea. They were so cute, but they were out of stock when I needed to run the race! I loved them so much that I bought them anyway and they arrived yesterday. I think I will sport them on the Manhattan Beach Boardwalk and Spread some holiday cheer. 4. iPod Shuffle – I am a huge music fan but I have to admit that the majority of the time I am streaming music online. I still buy MP3 albums for bands I love and especially for tracks I want to take with me on the go while running. I think the iPhone is too bulky to run with but the shuffle is nice and compact. Win! 5. Nuun Hydration Tablets – These are a staple in our house. I love Nuun. We go through these QUICK. They are a tablet you drop in water like Alka Seltzer and it dissolves and releases electrolytes and other good stuff. Plus it’s zero calories and has no sugar. I love them. 6. Nathan Hydration Handheld Waterbottle – This cute design by Nathan comes in many different fun colors but by far my favorite is the pink. A perfect compliment to any outfit for the running queen. What is on your holiday running wish list this year? Post in the comments and let us know! Yeah I love the socks too! Love the Rundies!! Never will we forget what run to do. 😉 Check out everything Oiselle including a Flight Kit that has an amazing Runfinity scarf, Nuun hydration, and Picky Bars! Great list!! I should have added the handheld water bottle to my list! Thanks, Mary! Where can I see your list?